Granlibakken's location in a peaceful 74 acre wooded valley a short distance from the shores of Lake Tahoe is the perfect setting for your wedding celebration. 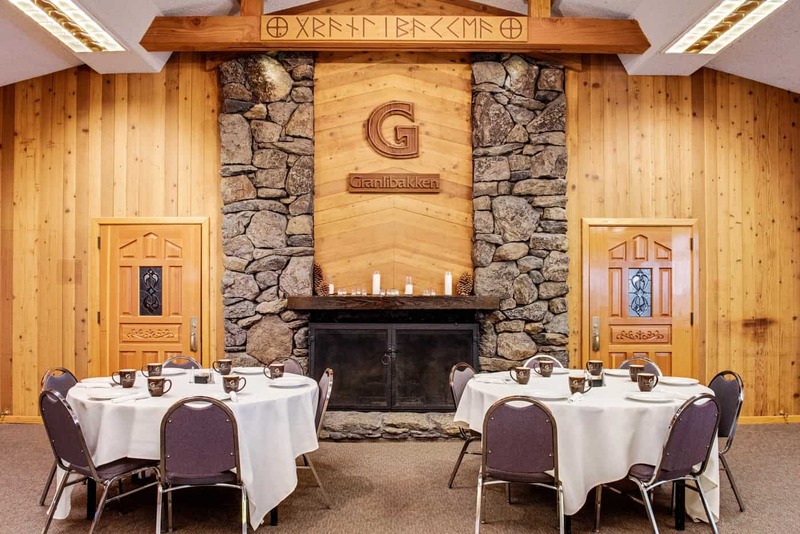 With a variety of indoor and outdoor venues that complement Tahoe’s natural beauty, Granlibakken offers the services, space, and rustic setting to make your day truly unforgettable. Granlibakken's flexible lodging options allow your guests to choose from a variety of room types, from five bedroom townhomes to suites, studios or bedrooms. With venue space for up to 350 guests, Granlibakken is well equipped to handle anything from intimate ceremonies to large celebrations. Wedding sites away from Granlibakken are an option - to be married at Lake Tahoe with a Granlibakken reception allows for the best of both worlds. Two nearby locations that work well with Granlibakken are the Tahoe Maritime Museum and the Gatekeeper's Museum ceremony site at the Lake. Both are within a half mile drive of Granlibakken. 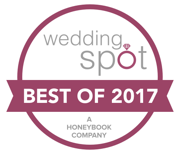 Our wedding package includes the ceremony and reception area, two nights of lodging in the seven-bedroom townhouse, breakfast each morning for 14 guests, a special dressing area for the bride, and a living room and kitchen for your rehearsal dinner for up to 40 people (catering not included). We offer a variety of memorable sites for year-round Lake Tahoe weddings. Book a winter wedding and get 50% off! Granlibakken is working hard to be more environmentally sustainable to protect the beautiful area that we are set in. We have made a number of improvements to our conference center, kitchen, and our lodging rooms as a part of this initiative. Learn more about our efforts and the recognition we have received for our green initiatives here. Specially designed for weddings and lawn receptions. Set apart from the rest of the resort, the lodge and lawn complement the wooded area surrounding them. The lodge is decorated with warm woods, open beams and a massive stone fireplace. A large outdoor deck opens to a sprawling lawn and natural landscaping including Ponderosa and Jeffrey pines. Outdoor with an elevated stage for the wedding party and a large seating area for guests. An intimate indoor location with a massive stone fireplace. The room effectively captures the magnificent mountain feeling of the Sierra and overlooks a deck that is ideal for Lake Tahoe wedding celebrations. Indoor site for up to 150 with adjoining deck, surrounded with windows overlooking the patio and rustic pines. Our Mountain Ballroom totals 5,400 square feet with 16 foot tall ceilings that make this room state-of-the-art! The Mountain Ballroom room also has a deck to enjoy the outdoors and can be divided into one or two/thirds. Intimate indoor Executive Lodge Room with adjoining lawn and deck. 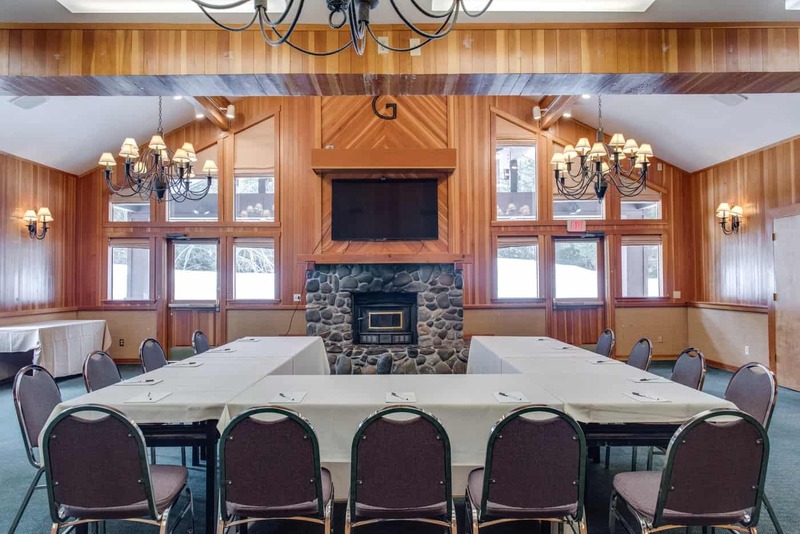 Reminiscent of the great room of an old Tahoe lodge with an all-wood interior, open beam architecture and an impressive stone fireplace, it is a wonderful setting for any special event. Our menu selections are varied and suited to your particular desires. Choose a sit-down or a buffet meal. It's your wedding and we will work to make the food and service perfect. From elaborate buffets featuring dishes like Stuffed Portobello Mushrooms, Mahi Mahi Sauté, and Top Sirloin with Maitre D'Hotel Butter and a "build your own soup and sandwich" lunch buffet, to theme dinners and elegant banquets with dishes like Petite Filet Mignon and Shrimp Sauté, Granlibakken's Chef Ron Eber prepares a variety of savory dishes to suit your group's taste. In addition to mouth watering hors d'oeuvres, main courses, and desserts, Granlibakken offers a complete wine and beer list, as well as a full bar. To see complete menu options download our wedding guide.